Detective: City of Angels is a board game where detectives solve mysteries in the dark and violent world of 1940's Los Angeles. Late pledge access is LIVE! Click the link below. 3,102 backers pledged $267,112 to help bring this project to life. Detective: City of Angels is an epic narrative-driven board game set in the dark and violent world of 1940's Los Angeles. Most players will step into the shoes of LAPD Homicide detectives that will do whatever it takes to solve the case, but one player will take on the role of The Chisel whose goal is to stall and misdirect the detectives at every turn. Inspired by classic film noir like The Big Sleep, the works of James Ellroy (L.A. Confidential), and the video game L.A. Noire from Rockstar Games, Detective: City of Angels is a mystery and crime solving game unlike any other. 4 unique sculpts are included in the game. Prototype sculpts shown here. Detective: City of Angels is a VRG Select title. This means that it will not be sold through normal retail channels. It will be available at the best price to backers of this Kickstarter campaign, for preorder/late pledge at a higher price through our pledge manager, and eventually through our website, at conventions, and/or through other direct partners. For more information see Update #9 here. Each case is beautifully illustrated by renowned artist Vincent Dutrait, creating a rich and gritty noire atmosphere. 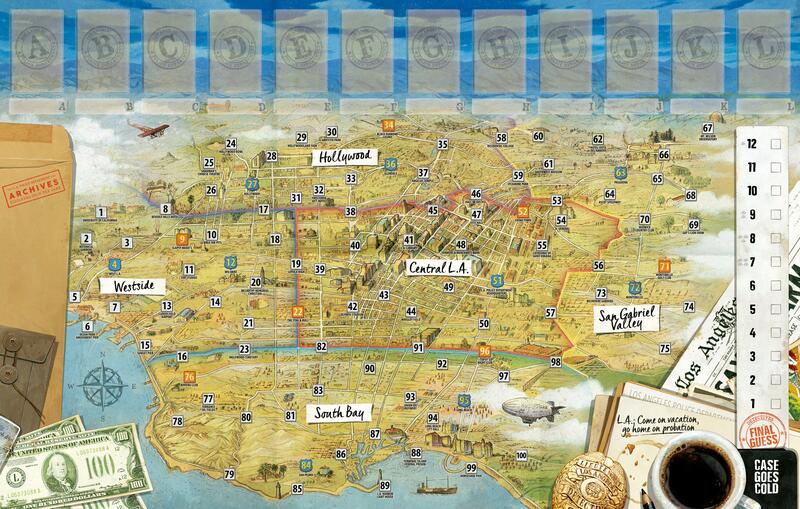 Detectives will explore every shadowy corner of the City of Angels, rendered in gorgeous and authentic detail on a massive 33x21 inch game board. The game board is based on an amazing public domain map created in 1932 by K. M. Leuschner, which Vincent has lovingly updated and adorned with his own touches. Click here to download the rulebook for Detective: City of Angels. This is the rulebook that was sent to reviewers and uses prototype components and art. It is NOT the final version! 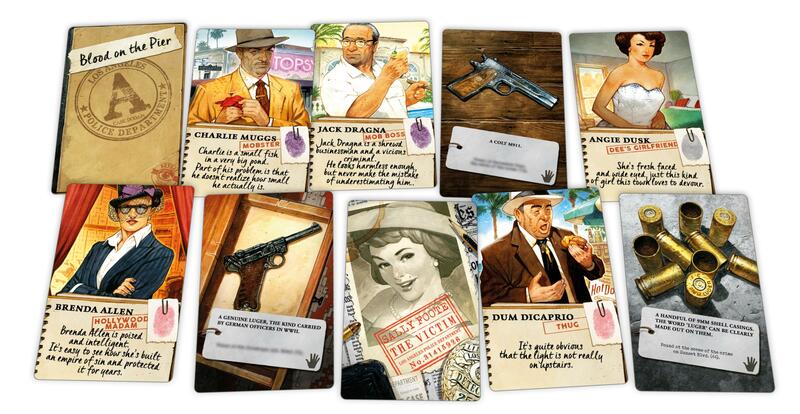 With 9 cases included and the option to play competitively, cooperatively (see below), or even solo (see below), Detective: City of Angels will provide hours of mystery-solving gaming. Plus, go all in for the Hardboiled Pledge level and get Bullets Over Hollywood, the first expansion which includes four additional cases, putting even more noir goodness on your table! While we highly recommend the game be played competitively, the versatility of Detective: City of Angels is such that it can also be played cooperatively against "The Chisel" or Cooperatively/Solitaire with no Chisel player. Playing cooperatively against the Chisel removes the "corruption" elements and the detectives become a team working together to solve the case. There is still competition with the Chisel though. Alternatively, this KS will come with a 64-page Solo/Cooperative case book and case grid cards that allows the game to be played without a Chisel player as the book will simulate the play of the Chisel. In particular, playing the game solo is a great way to prepare for your first game as The Chisel! Design of solitaire case cards and solitaire paragraph book is not final. In each of these modes of play the ARC system is in the spotlight and the competitive elements of the game, like scratch and bribe actions, are removed. The focus is primarily on solving the case and immersing yourself in the role of a detective. An important question with scenario-based mystery solving games such as Detective: City of Angels is: how replayable is the game? While detective players will not be able to experience a given case again as a detective (since they'll already know the solution), anyone can play the same case multiple times as The Chisel. In fact, it even benefits The Chisel to have played a case more than once! The Chisel will understand how the mystery works and have a better grasp of how to mislead and delay the detectives during their investigation. In fact, a case can unfold VERY differently depending on how the detectives pursue their investigations, always forcing The Chisel to stay on his or her toes even if it's a case he or she's already played. The below video has Richard "Rahdo" Ham's final thoughts on the game. To see his spoiler free run through of the game see the next video down. WARNING!!!!! HEAVY SPOILERS we only recommend watching if you plan to play the introductory case as The Chisel! Evan had a chance to speak with Charlie and Raf on the Ding & Dent podcast about Detective, and you can listen to that conversation here. We encourage multiple copy pledges which can really help save on shipping. If you are interested in multiple copies or a group buy, please contact the project creator using the Kickstarter messaging system for details. Shipping will be charged after the campaign in our pledge manager. Using the pledge manager, you will be able to confirm your rewards, confirm your address, and finalize your order with shipping after the campaign is over. For your convenience we have included shipping estimates for some of the more common geographical areas in the chart below. We endeavor to ship as inexpensively as possible while still being able to cover costs and get the games safely to you! "Detective is an epic journey! Because of the huge narrative aspect of the game, it's a real challenge to bring to life all the iconic characters and well-know places. I've never worked on a game with a "film noir" atmosphere before, and I did a lot a research to find precise documents and great references, all in support of helping the players immerse themselves deeply in the game and the city of Los Angeles in the 1940s. Another tricky challenge was to get the right tone and to capture the right mood! Working with Evan and the Van Ryder team has been incredibly rewarding as we worked so hard to share and convey our points of view with the players. We wanted to give them the chance to live out the stories and everyday life of Detectives & Mob characters." "Technically, I really enjoy to working on 'fake' illustrations, imitating textures, objects, colors and lights of past periods, which is a unique opportunity. I also enjoy bringing the characters to life, giving them authenticity, truth and credibility! 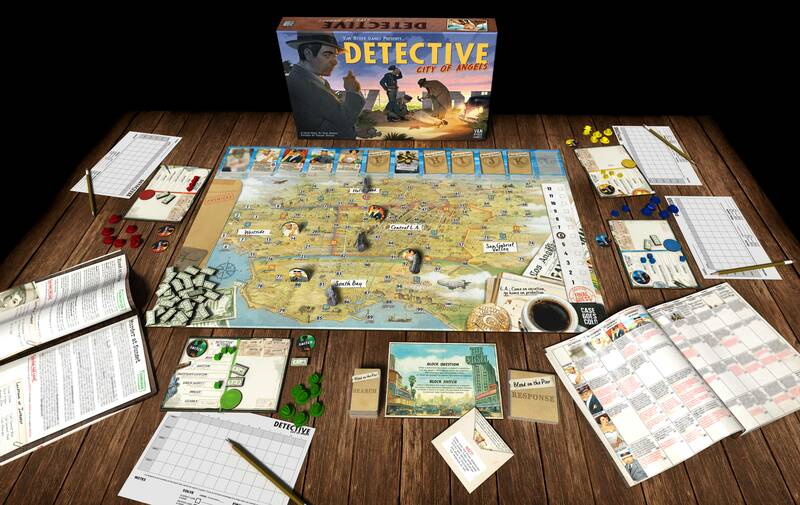 Furthermore, Detective is a fascinating project because of all the different component sizes and elements: I have to develop precise and accurate solutions for building the box, cards, boards and tokens in order to get the most cohesive ensemble!" We would like to thank James Van Schaik for his incredible sculpting work on the miniature in Detective. Thanks to him, each player will have his or her own miniature to move around the City of Angels! James has worked on many top grossing kickstarters including Gloomhaven, Defense Grid, Myth, Mercs, Relic Knights, Dreadball, and many more. As a sculptor, he has worked with Ral Partha, WizKids, Wyrd Miniatures, Games Workshop, Mantic, Megacon Games, Ninja Division, Soda Pop Miniatures, Pulp City, Battlefront, Gale Force 9, Dust Tactics, Reaper, Gloomhaven, and Lynnvander. See the many projects he has developed here on Artstation. Additionally you can find him on Facebook or visit his portfolio on Flickr. Game does not come with painted miniatures. Painted minis shown courtesy of Lester Bursley. OUR MISSION: Van Ryder Games LLC seeks to publish the best thematic games in the industry by creating amazing experiences, creating lasting connections with our customer base, and producing continuous revenue and profit growth. Special Thanks: Chase Williams, video producer extraordinaire (and also designer of a future upcoming VRG title! More on that at a later date! ). Music featured in the video is Noire #1, courtesy of Music by Pedro. As with all of our campaigns, we stand behind our products 100% and if you are unhappy with the game, you may return it for a refund up to 15 days after receiving it. We appreciate you being a first adopter and your ultimate satisfaction is most important to us. Van Ryder Games has successfully funded and fulfilled several projects. We learn more and more with each experience. Our goal is to get the games to you, our supporters, as quickly as possible, but we won't sacrifice quality for speed. There are the usual risks of printing, shipping, customs, and other unintended delays, but you can be sure we will deliver the games to you as promised. Feel free to ask any of our returning backers! One copy of Detective: City of Angels. Includes all stretch goals. Shipping will be charged AFTER project completion in our pledge manager (please see Shipping section of page for more details). One copy of Detective: City of Angels and one copy of the Bullets Over Hollywood Expansion. Includes all stretch goals.